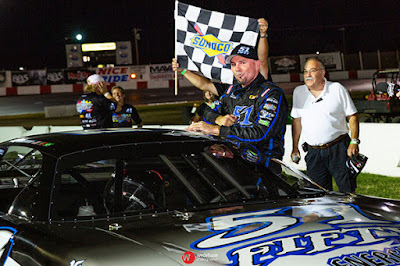 MADERA, CALIFORNIA (August 11, 2018) – A pressure-filled 63 lap green flag run to finish ended with Carlos Vieira taking his third career Pacific Challenge Series presented by PenneyLawyers.com victory on Saturday night at Madera Speedway. Vieira, of Livingston, CA, outlasted points leader Jason Romero in arguably the closest series event at Madera yet. Vieira topped a narrow Sunoco Fuels qualifying session by .002 seconds over Romero which saw only .086 seconds across the top-six. The American Racer Tire Dash for a set of tires went a different direction with Galt’s Matt Wendt winning it for the second event in a row. Wendt led the opening two laps of the 75 feature on the one-third mile before Cole Moore edged forward from the outside to lead lap three. Vieira used the outside himself to nab second from Wendt not long after. John Moore and Matt Scott had a nice side-by-side duel for fourth behind them as well. Vieira didn’t waste any time attacking Cole Moore using the inside to take the lead on lap seven. The leaders all started to move upstairs on the two-groove race track before things came to a halt on lap 12. A multi-car melee that included defending champion Mike Beeler, Mike Hite, and debutants Jacob Smith and Tyler Herzog blocked the front stretch for a red flag. For the third consecutive PCS event at Madera, Hite was eliminated with crash damage. The other three drivers continued on. John Moore used the restart to seize third from Wendt while Matt Scott battled side-by-side with Romero for fifth. Ripon’s Mike Ray suffered mechanical problems that bounced him from the race on lap 27. The Moores continued to battle as John Moore took over third from Cole Moore on lap 34 and went after Vieira for the lead. On lap 37, the top-six cars ran virtually nose-to-tail as the intensity never relented. Romero turned up the wick, passing Scott then getting third from Cole Moore on lap 38. John Moore started to challenge Vieira, with the duo making hard contact in turn four on lap 39. Romero closed down on them from third before the leaders made contact again on lap 46 in turn four. Romero nosed inside Moore on several occasions for second place before finally clearing Moore on lap 68. The remaining seven laps saw Romero try high and low to get around Vieira, going upstairs in turns one and two with three laps to go to no avail. Carlos Vieira fended off Romero for his third career Pacific Challenge Series victory after a 63 lap green flag run, with John Moore a close third. Cole Moore and Matt Scott rounded out the top-five. The championship battle sees Romero gain two points on John Moore for a 16 point gap heading into the 2018 championship race on October 13th at All American Speedway in Roseville, CA. The originally scheduled round #7 at Roseville on September 8th has been cancelled and the speedway will instead run a 150 lap special event for their local Late Model division.